The "Spires of Xin-Shalast" SoundPack gives you the complete audio solution when playing the "Spires of Xin-Shalast" Adventure. All the preparation is done for you, and every sound you'll need is right at your fingertips. Having steeped their weapons in the ancient magic of Thassilon, the PCs are finally ready to confront the newly risen Runelord Karzoug at the seat of his power. To do so, they must travel high into the mountains, to the fabled city of Xin-Shalast, where they’ll be confronted by enormous giants, dragons, and other monsters before they can finally confront the mad wizard of greed in his mountaintop palace. 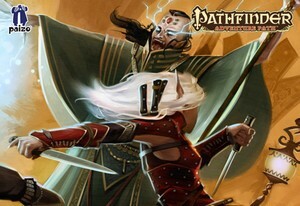 Pathfinder Adventure Path: Rise of the Runelords Anniversary Edition, Spires of Xin-Shalast © 2012.Paizo Inc., the Paizo golem logo, Pathfinder, and Pathfinder Adventure Path are trademarks of Paizo Inc. Author: Greg A. Vaughan. SoundSet © 2015. Sounds created under license with Paizo Inc.
Pathfinder Adventure Path: Rise of the Runelords Anniversary Edition, Spires of Xin-Shalast © 2012. Paizo Inc., the Paizo golem logo, Pathfinder, and Pathfinder Adventure Path are trademarks of Paizo Inc. Author: Greg A. Vaughan. SoundSet © 2015. Sounds created under license with Paizo Inc.